BlueWing Hearing Care’s approach is simple. Your success is our success. So we are passionate about creating the right plan for you based on your goals and budget. With over 25 years of marketing experience in the hearing care industry, we understand the long journey a patient takes from first noticing hearing loss to purchasing a hearing aid, and we have proven campaigns to reach current and potential patients at the time when they are ready. We target the best prospects at the right frequency for your bottom line. Give us a call. Imagine what it could be like if we focused on getting people in the door so you could focus on patient care. Built on your budget and goals, we calculate a percentage of your gross sales to form a budget plan for your hearing care practice. 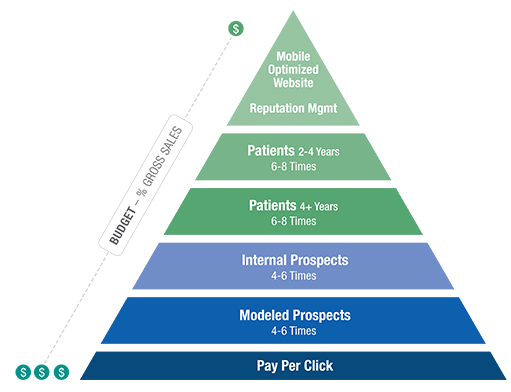 Then depending on your budget, we build the pyramid down and move to prospecting for new patients. Internal prospects (people who expressed interest but did not buy) are next, followed by modeled prospects (prospects who look like your current patients), and finally the broadest audience on the web. Powered by our industry knowledge and the integrity of our data, we help you target the right patients at the right time for the best results. Our advanced reporting tools give us quantifiable feedback on every campaign. As a business owner, you know that real results don’t come from trying something and crossing your fingers. Our strategy is driven by data, and our results are proven by data. Every marketing campaign is followed with a call tracking number to monitor and measure calls and response. We can even match back your sales files to our campaign data to see the path from lead to sale, and calculate a cost per appointment (CPA) and cost per sale (CPS). BlueWing Hearing Care is fully HIPPA compliant and takes your trust in us very seriously. We continually invest in technology to ensure our processes, controls and standards provide the highest level of security and confidentiality. We do it all. BlueWing is a unique company full of experts in every aspect of marketing for hearing care practitioners. From territory analysis to budget, database management to printing, and direct mail to digital marketing, we fulfill and deploy all your needs in-house. Some companies just do search engine optimization. Other companies only mail postcards. But we execute a full market analysis and implement every strategy from soup to nuts. See more details on our Multi-Channel Marketing and Web Services tabs. How do you start? Just fill out this form or pick up the phone. We're ready to give you a free consultation about improving your visibility, gaining more patients and raising your ROI.